Today I was reviewing my notes from the silent retreat I made at Ignatius House (Atlanta, GA) in February. This retreat was a three-day review of the Spiritual Exercises of St. Ignatius. Retreatants arrive and settle-in on Thursday night, and remain there through Sunday lunch. Silence is the gift retreatants give each other, permitting each to listen more intently to the gentle whisper of God (1 Kings 19:11-13). On Friday night, 24 hours into our retreat, I spent time in the company others reading silently in the library. Community matters, even in silence. Given our shared purpose of drawing closer to Christ during the weekend, there was a palpable sense of support from others without a word being spoken. Brief eye contact, a nod, or a quiet smile was all that was necessary and was fully understood. This sense of community is a good thing; a blessed reminder that in Christ we are one. Our identification with others parallels Christ’s identification with us—solidarity. So, let us not skip lightly over the the “we,” “us,” and “our” in communal prayer. And let us not abandon these signposts of community in personal prayer. Community matters! It is a fundamental part of Christianity Richly. 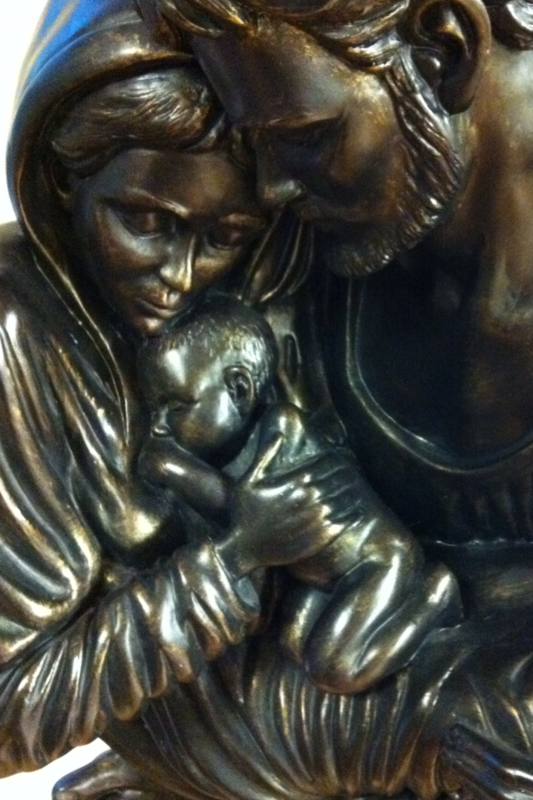 The photo is a sculpture of The Holy Family, located in the library at Ignatius House, Atlanta, GA. If you have visited Christianity Richly before, you’ll have seen the photos taken at my December 2010 retreat. However, you won’t have read much after that date. Life during the following 60 days was filled with Christmas, New Year’s, and helping open a new business. May it not be so for the remainder of 2011. If you’ve seen something of God’s grace here at Christianity Richly in the past., then please ask Our Lord to give me the strength and perseverance to write in 2011. Your prayers will be much appreciated. I pray not just have something to set before you, but in Christ’s abundance, something for you that nourishes richly!